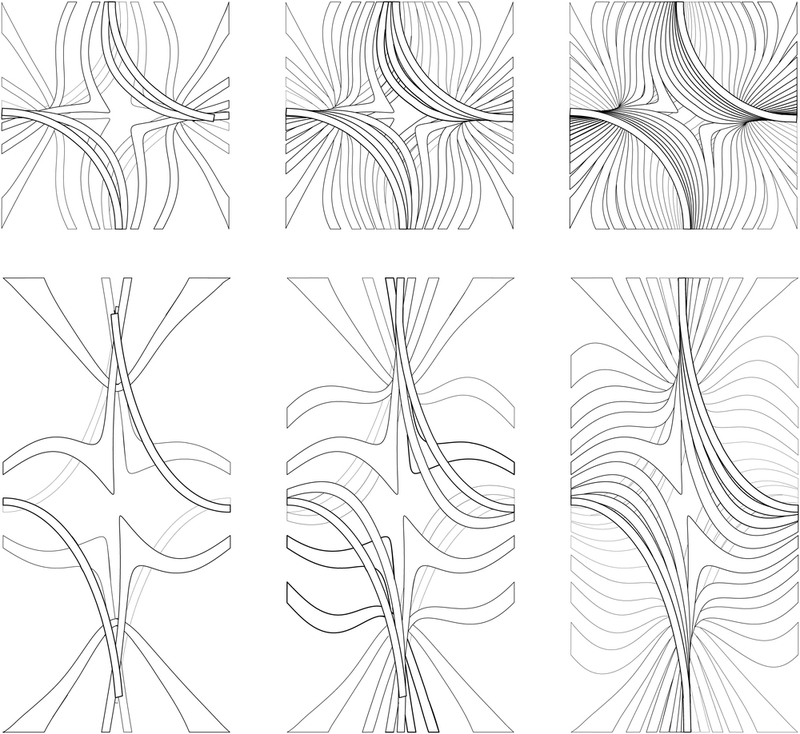 This ceramic tile system is composed of elements that are geometrically derived from the bat-wing typology of triperiodic minimal surfaces. 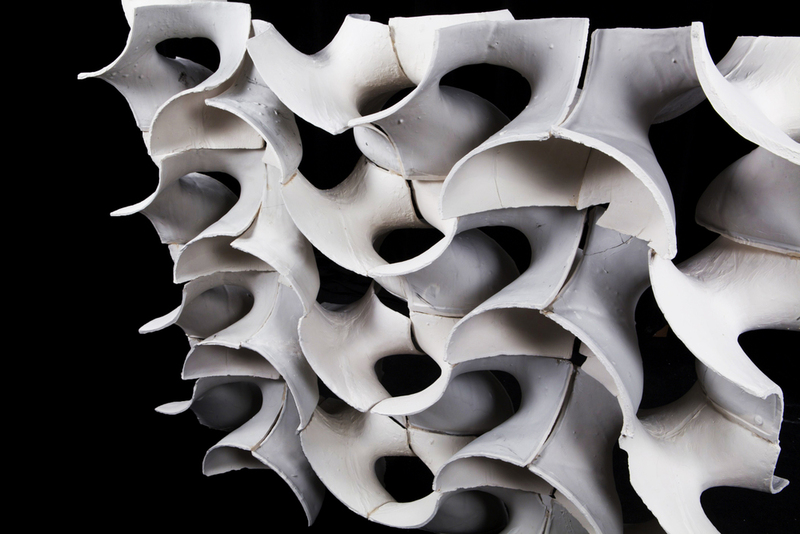 This specific modified minimal surface is composed of a twisted arch that follows the connective logic of the bat wing tiles. The process involved with making each ceramic piece was extremely arduous and at the same time specific. The process itself was designed in a way that could be repeated to allow for mass production. Each designed form was transformed from digital to physical by first milling in 3D and then its inverse form was cast in plaster. The plaster mold was cast and cut specifically to allow for separation from the ceramic form in a way that would not destroy the slip cast form. The mold was then filled with liquid slip and allowed to dry. Excess slip was poured out and then the remaining slip was set to dry. The proportions of time for each part of the process (pouring, drying, setting, removing, baking, etc.) as well as the proportions of space (mixtures of plaster, slip, size, volume, thickness) were all variables that had to be re-adapted and adjusted for every piece accounting for environmental factors and the wear and tear of the process. We had to treat the process as a science with extreme accuracy, but more importantly as a craft that required our own input and flexibility in understanding the process. This long and intricate process created a never ending set of problems involving uneven drying, cracking, spilling, breaking, uneven mixing, inconsistent timing and more. It forced us to constantly solve problems, adapt, and take every aspect of the process into account at all times. Through this process, we became material experts and developed a deep understanding of the inherent properties of the ceramic, plaster, and external influences on the process.